The Machinists union hopes to organize Airbus workers at the European jet maker’s new final-assembly plant in Mobile. But in “right-to-work” Alabama, it will be an uphill battle. MOBILE, Ala. — Boeing machinists in the Puget Sound region have sometimes wistfully assumed that Airbus, with its European “works councils” where management and labor collaborate on plans, might make a more union-friendly employer than Boeing. But that’s not the way Airbus operates in the United States. International Association of Machinists (IAM) spokesman Frank Larkin said management at Boeing Charleston and at Airbus Mobile appear “almost interchangeable” in their attitude to unions. The Machinists union has found that out as it tries to organize the Airbus workforce in Mobile. 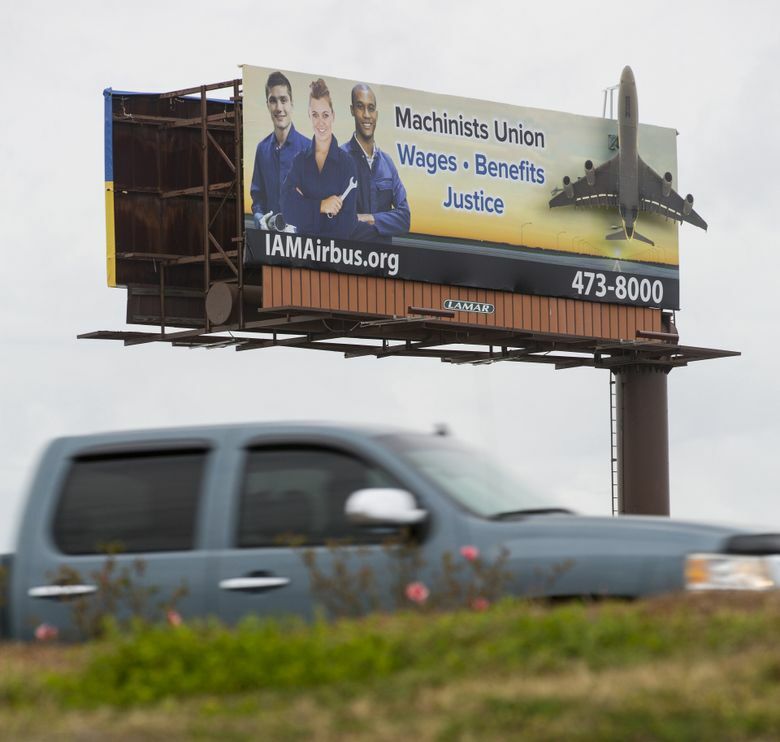 A billboard placed prominently at a highway intersection near the plant proclaims “Wages, Benefits, Justice” and promotes the website IAMairbus.org. At the grand opening of the Airbus final-assembly plant in September, about three dozen IAM members wore red union T-shirts as they ran in a 5K charity race on the Brookley Field runway to raise the union’s visibility. At the union website, Airbus employees are invited to sign an authorization card online. If the IAM gathered such signatures from 30 percent of the production workforce, it could call a vote to decide if it will represent the workforce. But the path toward organizing Airbus will not be smooth. For one thing, the political climate in this “right-to-work” state is just as hostile to unions as it is in South Carolina. Last year, the IAM collected enough signatures to call an election to organize Boeing’s North Charleston plant. In response, South Carolina officials from the governor on down waged a vociferous campaign to discredit the union, which eventually canceled the vote for lack of support. Mobile Chamber of Commerce Executive Director Bill Sisson said the reaction in his city to any such organizing drive would be similar. “We see it as a huge economic-development advantage to be a right-to-work state,” he said. Even if a union organizes a majority of employees in a workplace, and comes to represent the workers there, right-to-work laws mean they cannot compel everyone to be in the union — thus severely weakening union power. Gov. Robert Bentley told Fox News that Alabama’s status as a right-to-work state was a key factor in drawing Airbus. He strongly opposed earlier union organizing drives in the state, such as one at a Mercedes-Benz auto plant. In Europe, where social legislation makes it harder to lay off workers, union representatives sit with Airbus management on “works councils,” which help shape corporate strategies that will affect employees. But such collaborative bodies are illegal in the U.S., where labor organizations are required to be independent. In an interview, Airbus Americas President Barry Eccleston echoed Boeing management’s view of unions. He said that though it’s up to employees to decide if they want union representation, Airbus prefers to be nonunion in the U.S.
That’s made clear to all new hires, Eccleston said. “We told all the people we recruited that we were planning to create an environment where employees have a direct relationship with management,” he said. Airbus Mobile human-resources director Jennifer Ogle said that by treating employees well she hopes the plant can avoid a successful petition for union representation and the messy campaign that would accompany a vote. “If we do the right things, I don’t think it’s going to be necessary,” Ogle said.